The minivan and the mini-car are getting a reboot, a new way of being fun, with the rollout from Fiat Chrysler of the 2019 Fiat 500 and the 2019 Chrysler Pacifica. Both are winning great accolades and rave reviews, both are fun as well as practical, and both deserve your serious consideration. Let’s look together at all the reasons that Mount Airy should put you behind the wheel of a Chrysler Pacifica and a Fiat 500. Minivans have always been essential to family life, so why can’t they be fun also? Chrysler thinks they can be fun, and we are going to consider all the ways that the Pacifica makes essential family chores and tasks as enjoyable as possible. The most awarded mini-van 3 years in a row, having again been named “Best Buy” by Consumer Digest. The Pacifica is still winning awards, and with very good reason. 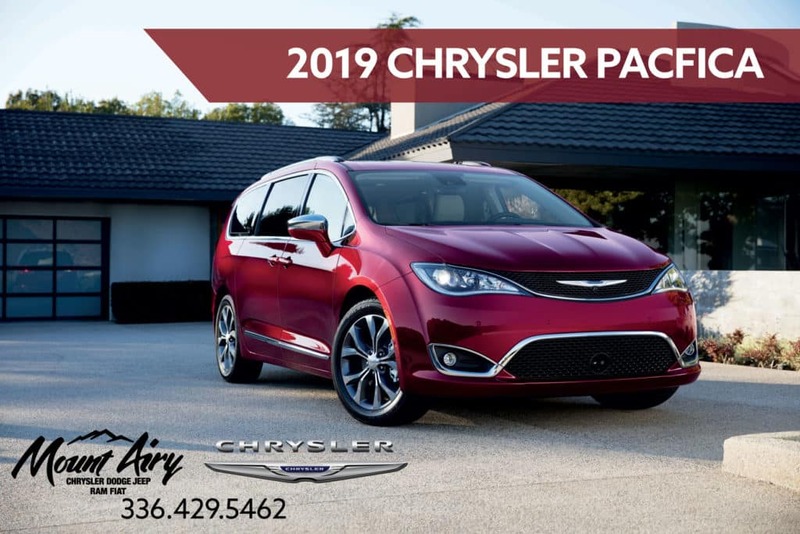 It recently won “Family Car of the Year” by Cars.com, for its 2018 choice, and the IIHS named the Pacifica its Top Safety Pick for 2019. And who doesn’t want one of the safest minivans possible, and mix it up with a bit of fun, so that driving it becomes one of the highlights of your day? Let’s start with some of the practical features that will get you behind the Pacifica’s wheel: to start, this is America’s first hybrid minivan. Yes, that’s right! And you know what that means—savings on your credit card statement and less trips to the gas station. With 28 miles per gallon, the Pacifica outperforms the Chevrolet Traverse, Toyota Sienna, and Kia Sedona. And with a 33-mile pure electric range on a full charge, an efficiency rating of 82 MPGe and a 520-mile total driving range, money-savings from fuel efficiency are certain. So, trips to Chick-fil-A, after school pickups, soccer practice, cheer practice, football matches, early morning commutes—all just got cheaper with the new hybrid Pacifica! Spend those dollars from your gas savings elsewhere. Perhaps a trip up to the mountains to ski, this winter? What about safety? The 2018 Pacifica won a 5-Star Overall Safety Rating from the National Highway Traffic Safety Administration, a 5-Star rating for its numerous safety features. Such features include 360-degree Surround View Camera, Full-Speed Forward Collision Warning with Active Braking, LaneSense system that helps with lane keep assist and lane departure warning, as well as, Adaptive Cruise Control with Stop and Go, to help you maintain a set distance between your Pacifica and the vehicle in front of it. And how about taking advantage of the available Parallel and Perpendicular Park Assist System, which parks the Pacifica for you, by controlling the steering wheel while it guides you through the moments you need to shift, brake and accelerate. These, along with 100+ other key safety features, add up to peace of mind. Is it any wonder that the Chrysler Pacifica consistently delivers unsurpassed safety ratings? The 2019 Pacifica comes with all of these features, so you can expect another 5-Star award when the NHTSA makes its next round of evaluations. You can be assured, when getting onto the road, that Chrysler will deliver serious protection to you and your family. Now let’s have some fun with the practical features of seating and storage, before we look at all of the features of the Pacifica that are just pure fun. First, the available 8 passenger seating can be configured up to 243 seating configurations. Do you need all of those? Maybe not, but the flexibility of so many configurations means you can easily have a full house in a commute, you can be ready for grocery shopping, retail therapy, the holiday hustle, or being a weekend warrior. The Pacifica’s configuration possibilities, along with the second-row Stow ‘n Go Seating and Storage System, which allows for increased cargo space, means it is ready for you to do just about anything that’s on your list. Flexibility plus space means the Pacifica is right on target for your family’s needs. Now what about the sheer fun of driving in the Chrysler Pacifica? Entertainment options abound with the Uconnect Theater system, providing endless fun on either a long haul, for family vacation or that trip to grandma’s, or those delays in traffic during morning, afternoon and evening commutes. And add to those moments great tunes, seamlessly delivering beautiful audio through the 20-speaker Harman Kardon Premium Surround Sound System. Does the Honda Odyssey, the Toyota Sienna, or the Kia Sedona have those? Nope, but the Chrysler Pacifica delivers all of this, and more. With dual 10.1-inch touchscreens, the Pacifica delivers the largest available dual touchscreens in its class. And it offers nine built-in games and apps that will help to occupy your kids for hours, with the Uconnect Theater. And don’t forget that the Chrysler Pacifica offers access to Apple CarPlay as well as Android Auto integration on the 8.4-inch infotainment touchscreen. You can make calls, send and receive text messages, get navigation commands, and read the specs on your engine’s performance while driving. Great entertainment, great audio, and an intuitive infotainment system means your minivan will rock out as much as you do. With the Chrysler Pacifica, fun is the name of the game. Its safety accolades, its cargo storage space, its flexible seating configurations, and numerous other practical features—all add up to you worrying less and enjoying more, when driving. So “fun” becomes the new way to think about the essential family vehicle, the minivan. With the Pacifica, the road has never been this much fun! And what about the mini-car? Perhaps the Fiat mini-car seems like a choice in vehicle that you would be likely to ignore, going for a small sedan instead. But, have you really looked at the Fiat 500? Have you really considered the advantages in gas mileage that such a smaller car sports, or how fun it can be to drive? Move over, Mini-Cooper, because the Fiat 500 has as much to offer, is as fun—and at a lesser price, to boot! Fiat presents the Fiat 500 as “equipped for anything, especially fun” and they couldn’t be more right! When Fiat offers a good-sized mini-car, excellent technology and stylish Italian design, what more could you want for your everyday drive? With its distinctive appearance and that 500 face, the Fiat comes in a few models that are sure to please, but the sporty coupe Fiat 500 is still a crowd-pleaser. 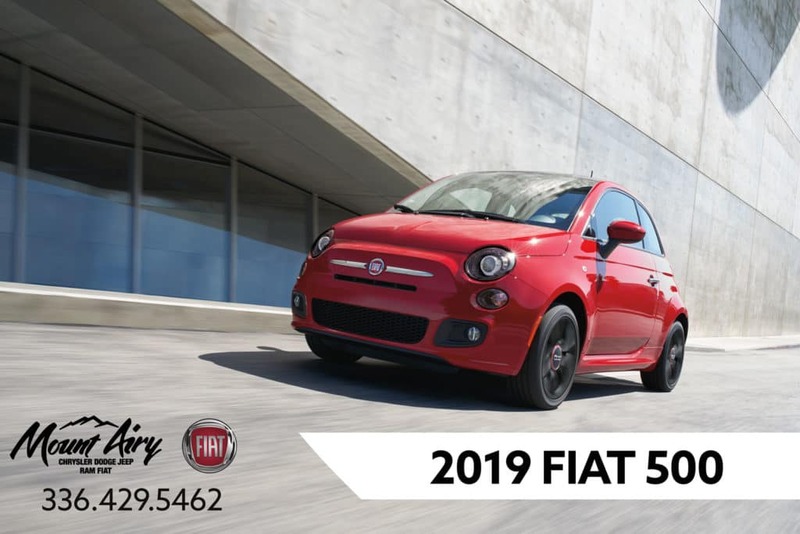 Motortrend dubbed the 2019 Fiat 500 a “boutique car” and that’s exactly the sort of fun it offers to the Fiat driver. It’s unusual, it is boutique, it is out-of-the-ordinary, it has “cheeky cuteness.” It’s a car worth talking about, and not just because it’s a mini-car but because it’s a good car that has a lot more to offer than a first glance would offer. Let’s get into what it does offer, so we can see just how much fun riding in the Fiat 500 will be. Starting with the 2018 Fiat 500, Fiat began using an engine similar to the one it exclusively has used in the Abarth model: a 1.4L, 135-horsepower 150-lb-ft turbocharged engine. More power and more torque means a zippier ride in the Fiat 500. You can get it in either 5-speed transmission or 6-speed automatic. All of that spells fun. The additional revamp of earlier models means better features in the 2019 Fiat 500, features similar to ones found only in the Turbo models but now standard, including: a rear spoiler, turbo badges, foglamps, 16-inch wheels, a larger performance braking system, and a standard back-up camera (which meets federal mandate requirements). What else makes this minicar alluring? Well, not only does it have distinctive Italian design and fashion sense, but part of the fun of the Fiat 500 is its color palette. Now the 2019 Fiat 500 offers eleven exterior color options and nine interior color choices, meaning you can really outfit the Fiat to genuinely reflect your personality. Be audacious, be bold; be sleek and suave; be conventional but with a twist—the color pairings make all those options possible. And that, too, spells fun. Its unique, standout interior vividly conjures up images good Italian fashion sense and running the motor speedway in Monte Carlo. Cruising through the Piazza in Rome or making hairpin turns down narrow streets—the stuff of movies—easily springs to mind when you climb into the Fiat 500’s interior and see its sleek, boutique design. This is a fun-loving car, through and through, so it’s out-of-the-box interior, with its surprising spaciousness, beautiful dash, and unique interior trim, adds up to a desire to drive. This is the sort of car you want to drive, because it makes everything more fun, sporty, and stylish, all at once. And what about fuel economy? What many may not imagine the Fiat can do, is the very thing it does well: 28 miles per gallon in the city and 33 miles per gallon on the highway, adding up to 30 mpg combined driving. Compared to sedans and other compact cars, Fiat 500’s performance puts it on firm footing. And with a price point starting at $17,490, the Fiat’s stylish, zippy fun beats out the higher priced Mini-Cooper and Volkswagen Beetle. It’s more fashionable and far more fun than the others, which have become pretty typical these days. Why find yourself in the typical Mini-Cooper or Beetle when you can change it up with a great, unforgettably-designed Fiat 500? The German carmakers have had their day; let the Italians show you how to really live la viva bella—the beautiful life. And why not have a bit more fun on a bit less money than its supermini competitors? Budget-friendly la viva bella is not a bad way to live, and what counts is all the fun you will have! 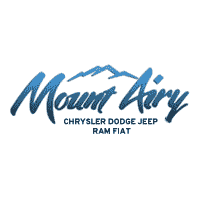 Mount Airy’s commitment, to putting you into safe, reliable vehicles that are equally fun and a pleasure to drive, cannot be under-stated. We are committed to your safety and your enjoyment of driving, and we are convinced that the Chrysler Pacifica and the Fiat 500 do just that. The Pacifica gives you all the safety features and practical conveniences to make family drives all you expect, and it adds a twist of fun into the mix. The Fiat 500 spells out “fun” with its sleek style, its fashionable interior, and its zippy, fun-loving drive. You cannot go wrong with either choice, so what it comes down to is a simple question: which vehicle better fits your needs? Do you need a truly better-than-typical minivan or are you looking to zip about town in the unique look of the Fiat 500? Or do you need one of each: the family wagon for those days of essential family life, and the fun you know that the Fiat 500 promises you when you can get a night out on your own, for a ladies’ night out or a guys’ Sunday hang at the local sports bar?